In the distant past teens largely went online to research an assignment or play a game. These days, your teens are practically attached to their computers, updating social media profiles, streaming their favorite show, or watching YouTube clips. Even if they have friends over, it’s not uncommon to see all of them huddled around the computer doing something online. You’ve probably heard that increased internet use is associated with poor eating habits, lessened physical activity, and behavioral issues. However, a study published in the journal Injury Prevention shows that internet addiction can also lead teens to cause themselves harm through pulling their own hair or hitting, pinching or burning themselves. A survey of more than 1,600 teenagers in China found that teens who were moderately addicted to the internet were 2.4 times more likely to have self-injured themselves in the past six months than those with normal internet habits. Teens who were severely addicted to the internet were nearly five times as likely to injure themselves. Though self-injurious behavior can be attributed to many different factors, such as depression, stressful life events or family problems, the study found that internet addiction on its own can lead to teens harming themselves. Internet addicts can also experience physical symptoms such as dry eyes, backaches, migraine headaches, and carpal tunnel syndrome. Limit time spent online. With unlimited access to the internet 24 hours a day, stopping an addiction is nearly impossible. Set limits on the amount of time your teen is allowed to go online. If necessary, monitor smartphone usage and log them on and off the computer so that you make sure the time limits are followed. Take the computer out of their rooms. If your teen has a computer in their bedroom, it’s easy for them to get online when you’re not around. Move the computer to a shared room so that you can see how much time they are spending online and better monitor their habits. Ask them about it. Though there’s a good chance your teen will deny having an internet addiction, and may not even be aware they have one, ask them about it. Find out why they are going online and what their internet habits are to help determine if there is an addiction to be broken. Get them help. Much like any other addiction, an internet addiction likely requires professional treatment. Therapy can help your teen address the addiction, any underlying issues causing the addiction and issues related to self-injury. If outpatient therapy is not enough to break your teen’s addiction, you may want to seek help through a residential treatment center or therapeutic boarding school, where your teen will have a supportive environment in which to break their addiction and learn healthy coping mechanisms. Don’t think that your teen’s internet addiction will just go away on its own. With the increasing use of the internet in every facet of life, your teen will need to learn to have a healthy relationship with the computer. 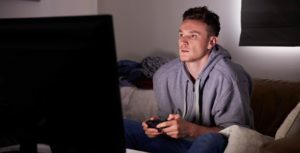 And if an internet addiction is causing your teen to injure themselves, taking steps now can help them better learn to manage any stress or anxiety that is causing them to do so.